When purchasing replacement windows, there are several key factors to consider before making your decision. One of those considerations is which type of glass is best for your windows. In this blog post, we will discuss the benefits of double- and triple-pane glass. Triple-pane replacement windows, as their name indicates, are made of three panes of glass. Great for areas or climates with extreme weather, triple-pane replacement windows are even more resistant to condensation than double-pane replacement windows. Windows with triple-pane glass can significantly reduce the amount of noise heard through the window due to the extra glass pane and layer of insulation compared to windows with double-pane glass. Triple-pane windows are ideal for rooms that face outside noises like busy streets, close proximity to neighbors and more. Because of the additional materials needed to construct them, triple-pane windows are heavier than double-pane windows and typically cost 25-30 percent more. Stanek Windows offers Comfort-Gard® XTREME High-Performance triple-pane glass, which is the most energy-efficient glass on the market. 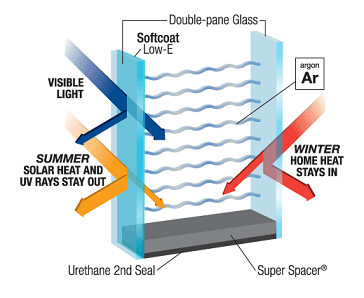 Our triple-pane glass contains two layers of soft-coat Low-E. Low-emittance (commonly known as Low-E) coating, is a microscopically-thin metallic oxide layer that’s deposited on the window to suppress radiative heat flow. 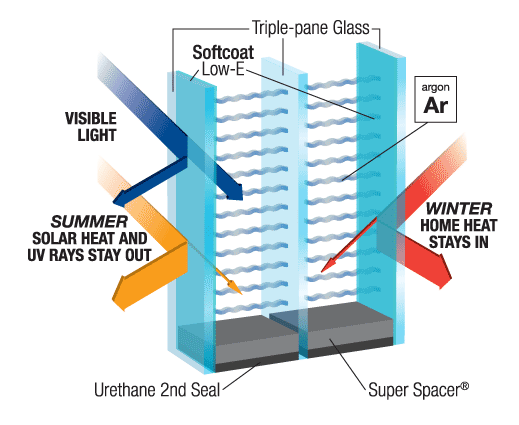 The glass panes are separated by our non-conductive Super-Spacer technology and contain a second urethane seal to keep the argon or krypton insulating gas secured between the panes. Stanek triple-pane window glass also receives the highest energy rating from ENERGY STAR®. Our Comfort-Gard® XTREME High-Performance triple-pane glass is available in all window options. If you are looking for the most energy-efficient windows for your home, triple-pane glass is your best bet. The most popular option, double-pane replacement windows are a great choice for homes in all climates. Stanek’s double-pane glass comes standard in our replacement windows. Argon gas is inserted into the glass unit for insulation. Our Comfort-Gard® PLUS High-Performance Glass is one of the most advanced glass options available that will not decrease the amount of light in your home. Are you tired of the fabric and furniture in your home fading? Our double-pane windows block UV rays 90 percent more effectively than ordinary glass and control glare in bright, sunny climates. Double-pane windows can also add value and curb appeal to your home due to their low-profile design. 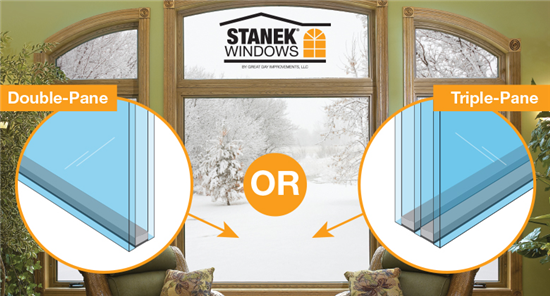 Stanek double-pane windows retain more heat in the winter and reflect heat in the summer, due to their multi-layer, soft-coat Low-E and warm-edge Super Spacer® technology. Our Super Spacer® technology helps prevent seal failure and prohibits the transfer of heat. Whether you choose double- or triple-pane glass, Stanek Windows can create the perfect custom replacement windows for your home. The energy efficiency of your windows relies on the correct combination of frame, glass and installation. 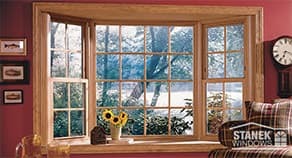 The proper installation of your windows is essential to their overall efficiency and performance. At Stanek Windows, our factory-trained installation staff members provide expert installation, which ensures the long-term performance of your windows. With so many window companies out there, it can be tricky to know which company is best for you. Stanek high-performance energy-efficient windows are custom manufactured with exceptional attention to detail and superior quality materials. 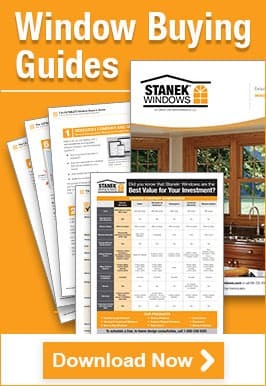 Stanek windows also meet all NFRC, ENERGY STAR® and NAMI® requirements. For more information on these organizations and our window ratings, visit our certifications and associations page. If you’re ready to learn more about our custom replacement window options, schedule your free, in-home estimate today, or give us a call at 800-230-8301.